COLUMBUS — About three out of four youth baseball players between 8-18 years of age report experiencing arm pain while throwing, according to data previously released by the American Sports Medicine Institute. Because many of the most common baseball arm injuries are preventable, experts at Nationwide Children’s Hospital Sports Medicine have designed a unique baseball performance-training program for all skill levels to help address the majority of injuries caused by overuse and improper throwing technique. Personalized baseball injury prevention training at Nationwide Children’s incorporates a focus on age-appropriate communication to help maximize results, as well as hands on instruction that emphasizes mobility/flexibility, core stability, acceleration, strength and power and recovery. Additionally, athletic trainers provide continuous education about proper nutrition, rest from activity and the importance of quality sleep beyond the playing season. One of the key components of the injury prevention training is video analysis, which displays an athlete’s exact stance and their throwing mechanics frame by frame. Compared to other sports, baseball tends to cause players to put more strain on their upper bodies, including the shoulder, where 17 percent of high school baseball injuries occur according to a 2012 study. The video analyzes real-time measurement of the angles of a player’s body and arm and that helps athletic trainers establish proper individualized throwing technique. For example, video analysis can illustrate an improper throwing stance that training and systematic drilling can correct over time. “The year before I started the program, I experienced a lot of soreness after throwing,” said Jeremiah Cangelosi, a pitcher for Watkins Memorial High School in Pataskala, Ohio. “The breakdown of the video helped me see that I was throwing with all arm and I was not throwing in time with the rest of my body, which put a lot of strain on my arm. We worked on that every time and I was really able to see how I was improving and I’m a lot better because of it,” continued Cangelosi, who also plays shortstop for Watkins Memorial. In addition to pitchers, all athletes who participate in the program are able to view the video on their smartphone or desktop computer and practice the correctional drills recommended by the athletic trainers in their free time in addition to following health and wellness advice. The Nationwide Children’s Hospital Sports Medicine staff of doctors, athletic trainers and physical therapists are trained to provide age-appropriate care for patients. The Sports Medicine program emphasizes the importance of early injury recognition and treatment in order to prevent recurring injuries. In addition to treatment, Nationwide Children’s partners with parents and coaches to focus on injury prevention, conditioning and age-appropriate activities. Children and teens to age 18 require expert care, especially when they are serious athletes. Because these kids are still growing, their health care needs are unique. 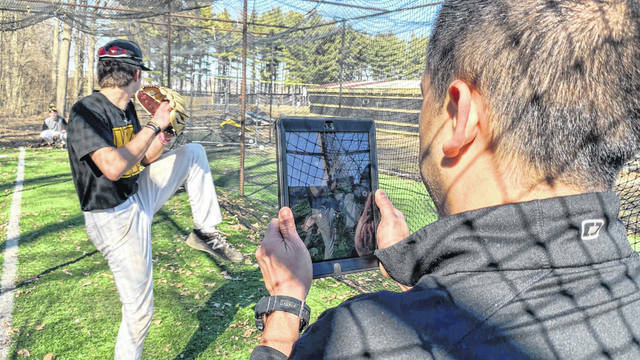 https://www.delgazette.com/wp-content/uploads/sites/40/2019/04/web1_4-overshouldervideo.jpgAthletic trainer, Michael Macatangay, takes a video of Jeremiah Cangelosi pitching. The video will help pinpoint and correct any issues with Jeremiah’s throwing form that may put extra strain on his arm and lead to injury.